Could Brexit bring back the royal yacht? Conservative MP Jake Berry has called for the Royal Yacht Britannia to be brought back into service to help the UK strike trade deals as it negotiates its withdrawal from the EU. Why does he think a yacht could boost trade, and how likely is the proposal? What is the royal yacht? The 83rd royal yacht's time in service began very soon after the Queen's reign began, as it was commissioned only a few days after the death of her father in 1952. Thousands came to watch when the young Queen launched the yacht the following year, from the John Brown & Company shipyard on a gloomy day in Clydebank. "Special buses had brought from all parts of the county 5,000 children, who waited in the rain to cheer the Queen," the Times reported. That pattern was repeated on a larger scale as the yacht travelled around the Commonwealth and to other European countries, taking Princess Margaret, the Duke of Edinburgh and the Queen on trips to the Caribbean, Australia and Canada. Britannia went on to undertake 968 official visits, including the handover of Hong Kong, and received guests including Winston Churchill, Nelson Mandela and four US presidents. The yacht, 412ft with a crew of 240, was a kind of floating palace, including a state drawing room, a state dining room and the Queen's sitting room as well as numerous bedrooms. It was also seen as an asset in Britain's efforts to forge diplomatic and trade links, particularly when it came to what was known as "British invisibles" - exports such as shipping and insurance. The Queen is reputed to have a strong attachment to Britannia, once describing it as "a place where I can truly relax" and appearing emotional at its decommissioning ceremony. Why was it taken out of service? Britannia's future was a talking point in the run-up to the 1997 general election. Prior to the poll, on 1 May, the Conservative government announced Britannia would be retired and replaced with a new yacht. Labour, however, refused to commit itself, and after the party's election victory - and consultations with the Queen - the decision was taken not to replace it. But the role and maintenance of Britannia had been a political issue for much longer - since its launch, in fact. In the early 1950s, Labour MPs suggested it was "a useless symbol of luxury" and deplored the "frightful expense" of building and modifying the yacht. Defenders of the yacht said it was the best way for the Queen to travel long distances and that it was in line with Britain's maritime traditions. Since it was decommissioned, Britannia has been moored in the Port of Leith, and maintained by the Royal Britannia Trust, where it attracts hundreds of thousands of visitors each year. Almost as soon as the yacht was decommissioned in 1997, people began to call for its return, with strongly worded letters written to newspapers, and MPs repeatedly raising the issue in Parliament. The question of the yacht's future resurfaced prominently at the time of the Diamond Jubilee, in 2012. Former cabinet minister Michael Gove wrote to then Culture Secretary Jeremy Hunt, saying: "In spite and perhaps because of the austere times, the celebration should go beyond those of previous jubilees," and proposing "a gift from the nation" in the form of a royal yacht. He was mocked at the time by opponents, with Labour calling him "out of touch". But now the proposal is front-page news again. Conservative MP Jake Berry is leading calls for a revival of the royal yacht, telling the Sun: "it could bring in billions of pounds' worth of trade deals for post-Brexit Britain." Former head of the navy and Labour peer Lord West of Spithead would also like to see it make a comeback. He told the BBC: "It was a terrible shame we got rid of it, especially since her majesty was so fond of it." He was on the vessel when it sailed to Hong Kong as part of the 1997 handover process, and said: "There were lots of deals signed on it, and it would certainly be useful as we try to carve out new trade deals after Brexit." But Deirdre Brock, the SNP MP for Edinburgh Leith, where the vessel currently resides, said: "While it's an incredibly successful tourist attraction, it's a museum piece, and the calls to revive it or replace it seem to be harking back to the days of empire." And Jonathan Reynolds, a Labour MP who sits on the Business Select Committee, said: "If that's their answer to the serious economic questions we're facing after Brexit, it's very worrying". Rear Adm Neil Rankin, who chairs of the Royal Yacht Britannia Trust, told the Telegraph bringing the original vessel back into service was a "non-starter". The yacht is now considered out of date and sailors would need to be retrained in order to man it, meaning a new yacht would probably need to be built. Lord West said there was "no way we could revive" Britannia but there were other options, such as "a sailing ship on which we could train youngsters". He said it would need a Royal Navy crew, and the "nation should be willing to pay for it", although, in his view, the money should not come from the defence budget. 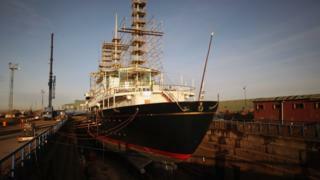 There are conflicting reports over the appetite at the top for a replacement royal yacht. Foreign Secretary Boris Johnson is said to be a fan of the idea (Jake Berry is one of his closest allies in Parliament), as is Shipping Minister John Hayes. Meanwhile, the Huffington Post has suggested the prime minister is not on board - and, as Lord West points out, it would also need a seal of approval from the Queen. But on 11 October the government will have to respond to a debate in Parliament on the topic, and nail its colours to the mast.